I was originally not going to come up with an upcycled craft for a cereal box because we don't buy cereal. Instead, we usually eat oatmeal, either rolled oats or steel cut oats, but 2 weeks ago, I was preparing to pack to go to Pennsylvania and Indiana, so I decided to buy my daughter some Cheerios. 1. Cut a 3 1/2 inch X 2 inch rectangle. 2. 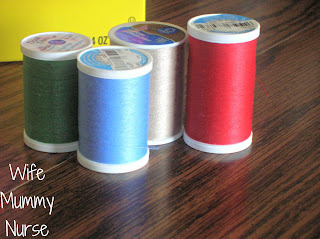 Get an assortment of different thread colors and cut them to desired length. Wrap around the rectangle. 3. 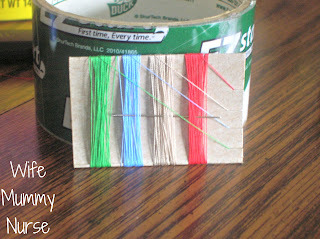 Place pin between the thread and put in a container, such as a baby food jar. 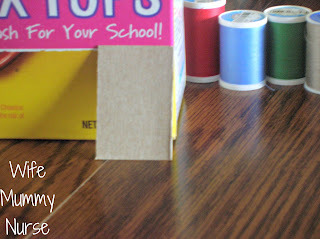 What uses for cereal boxes have you come up with?